This post will outline how you can create a public and private RSA key pair, and then we will use that key pair to authenticate ourselves to another computer in the network. If you have previously created a key pair, you will be asked to replace this. For my home machines I don’t use a passphrase, if you’re more paranoid (or careful) you can do so. Please read this article for more info on passphrases and how to use them. 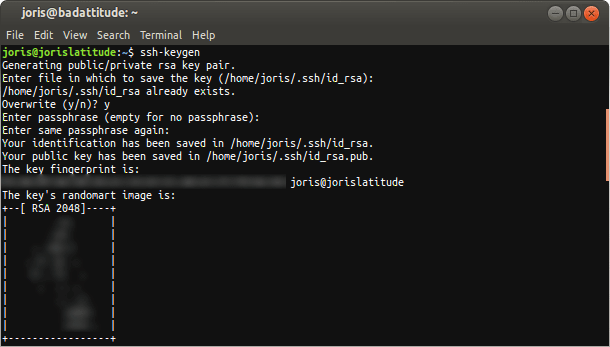 The keys have been generated in /home/yourloginname/.ssh and are called id_rsa and id_rsa.pub. Never, never send someone your private (id_rsa) key! That is the same as handing over your house keys.. This step should be repeated for all hosts to which you want to SSH with the newly created RSA key pair. You will need to enter your password one last time, after that your public key is added to the authorized_keys file, which is automatically created on the target system. After this step you don’t need to use a password any more!